Why rely on the marketplace websites as the only Internet presence for your listings? Stand out from other agents and show your client their own website showcasing their house and only their house. When you spend your marketing efforts sending potential buyers to a link on a listing service website, you are also giving them the opportunity to browse other listings instead of focusing solely on your listing. Impress your buyers AND sellers and gain a competitive edge over other agents! We will create an elegant and mobile friendly website for your listing with its own unique domain based on the house address. This is a URL you can print on your brochures, share on social media and send to your client so they can share with their friends. 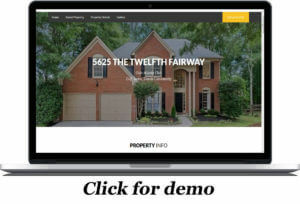 Imagine how impressed your client will be when they see their own, exclusive, website showcasing their house instead of just seeing it on a list of other houses! Imagine this…you have a potential buyer driving by one of your listings, they pull a brochure out of the box and want to learn more about the property…see pictures, maybe a video slideshow…which would they more likely type in their phone’s browser? Videos are a powerful marketing tool and you have the option of adding a professionally designed video to your Showcase website. We will also provide you with videos formatted for social media sites. Affordably priced at $200 with discounts for multi-listing packages. Optional videos are $50. Sign up now and receive your first video FREE! JD Marketing Design has been in the Internet/Digital Marketing industry since 2005 and the partners have over 43 years of combined experience in the software/technology/marketing industry. We are a US company with offices in Chattanooga and Atlanta and our approach is to partner with our clients and provide you with tools to enhance and grow your business. We won’t confuse you with complicated technical lingo, we just deliver results! Instructions Once you submit this form you will be taken to PayPal to complete your transaction.